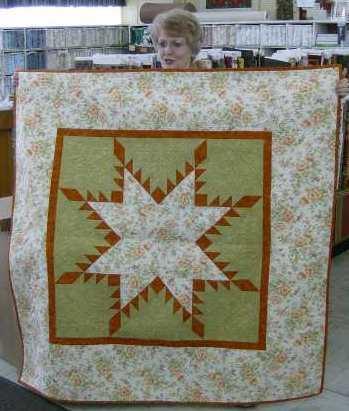 This Bodacious Feathered Star Quilt was made by Carol Higdon from Lexington, Indiana. Carol came in the store today and brought this quilt with her and we are glad she did. What a beautiful Quilt. Carol took this class here at Craft Town from Julie Lambert. This entry was posted on Monday, July 20th, 2009 at 5:03 pm and is filed under Uncategorized. You can follow any responses to this entry through the RSS 2.0 feed. You can leave a response, or trackback from your own site.